The Korean Happiness Festival, the biggest and one-of-its-kind Korean event held in the UAE, featuring a series of cultural and traditional shows opened today (November 1) in Abu Dhabi. Organized by the Korean National Tourism Organization [KNTO] Dubai office and hosted by the Ministry of Culture, Sports and Tourism, Republic of Korea, at the Rotana Beach Hotel in Abu Dhabi, the festival was inaugurated by Yeonjean Yoon, Deputy Head of Mission – Embassy of the Republic of Korea in the UAE in a gala opening ceremony. The event showcases everything about Korea – be its vibrancy, rich cultural heritage, touristic attractions or its medical attributes. 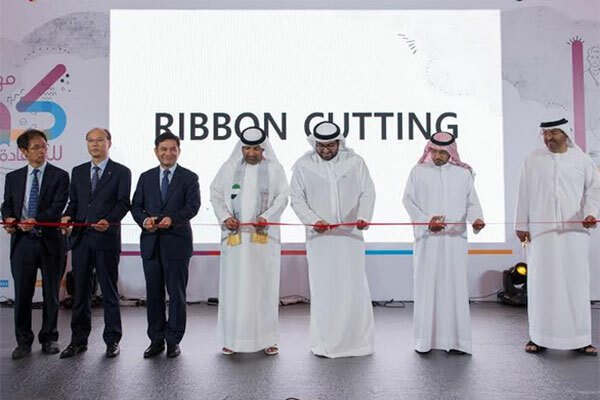 The opening ceremony was attended by Manjin Kim, acting executive vice president of the Korea International Tourism Division, a large number of UAE nationals, Arab visitors as well as Koreans living in the UAE. The festival continues until November 3. The Festival’s opening day events comprised glass portrait paintings by famous group of Korean artists (Original Drawing Show). UAE nationals and Arab visitors also enjoyed the Korean fusion music using traditional Korean instruments and modern instruments (An Jin Sung Haeguem Band) at the happiness festival. The day also witnessed a lot of enthusiasm and interest among the UAE Nationals who were keen to know more about the medical facilities in Korea and information about various treatments on offer in the country. They also explored the Korean culture by partaking of the cultural activities such as making the Korean accessories, attending Korean food classes besides enjoying Korean music as well as art performances. As part of its opening day event, a special medical talk was also organised by Korean doctors along with UAE patients who have been treated in Korea, and they shared their experience about the treatments and facilities in Korean hospitals. Other attractions on Day 1 included an Influencers’ Event, seminars by Korean beauty clinics and cosmetics brands as well as a K-Pop zone for Korean music fans. The Korean Happiness Festival events also catered to the needs of the UAE national women, who were interested to know more about the Korean beauty tips and skin care products. The female visitors also attended the ‘Korean Beauty Secrets’ ladies session, presented by leading Korean cosmetic brands such as The Face Shop, Etude House as well as attended by social media influencers Fatemah and Khawla as special guests from Kuwait and Bahrain. Special skin care analysis, nail art, make-up workshop, and other activities were also held for the women. The festival also had its share of excitement for children, with a wide array of special attractions in the kids zone such as cartoons, remote control games, drawing session and eye glider games. The three-day Korean Happiness Festival is expected to welcome over 5,000 visitors. As part of the festival, Korea Tourism Organization is also hosting two other events on the sidelines, which include an event for Zayed University students and faculty on the second day to introduce them to the Korean culture, and a business meeting between the travel trade of UAE and South Korea.